What are the aims of Forest School? To enjoy learning in an outdoor, natural environment. Forest School is for everyone. All children are able to take part and develop and learn from forest school experiences. Children at Holden Clough will have the opportunity to take part in forest school activities throughout the year. The Year 3 children discussed the importance of being kind to each other and being considerate and respectful to everyone. Year 3 children worked together with a partner to make a friendship bracelet and a zip pull for their jacket/coat. The children demonstrated that they had good communication skills to help their partner find the wool in the forest area so that they could make a friendship bracelet. Year 5. Being safe around the fire. 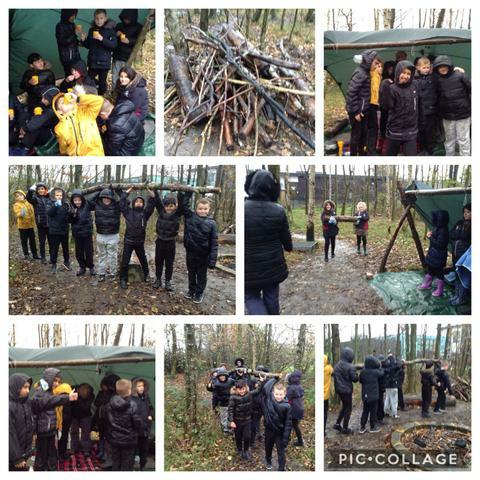 One half of Year 5 worked together to put up a shelter on a cold and wet Tuesday afternoon, whilst the second half of the group collected wood to use as fuel for the camp fire. The children discussed the importance of keeping the wood dry so that it can be used to burn on the campfire. The children had a well deserved cup of hot chocolate and a biscuit after all their hard work. The children did a fantastic job and once the wood dries out we will be able to use it to burn on the fire. Well done Year 5.